BullsEye: Trump’s Brand Causing Unfair Competition? Trump's Brand Causing Unfair Competition? “We cannot compete with the president’s brand,” reads the complaint. While the United States presidency is certainly a powerful position, we have never thought of it as a status capable of being trademarked - but it is an interesting concept. In a recent antitrust suit against President Trump, a local business on the hill is claiming potential patrons are being diverted to Trump’s hotel on Pennsylvania Avenue as opposed to their establishment because they are drawn to his position as president. In other words, Trump’s “brand” is unfairly hindering competition. This not only begs the question of whether political allure can qualify as unfair competition but, perhaps more importantly: Does the president have a “brand” capable of competition? In the suit, Cork Wine Bar, located near Trump’s luxury International Hotel on Pennsylvania Avenue, has filed an unfair competition action against Trump personally, accusing him of stealing business away from the wine bar because patrons are attracted to Trump’s status as president. Specifically, the suit claims that since the election, lobbyists, foreign dignitaries, and government officials hoping to curry favor with Trump are overwhelmingly choosing to dine at his luxury hotel on Pennsylvania Avenue rather than Cork. This, Cork claims, is forcing it to have to unfairly compete with the president’s brand. Typically, a “brand” is a logo or marking created by a company for commercial purposes, i.e., so consumers recognize and choose their product. Could you say the same is true for our presidents? Do they brand themselves, with either a campaign or a mantra, in order to prompt U.S. citizens to recognize their platform? Many presidential candidates create actual logos for their campaign for the very reasons of immediate recognition and voter support. Does this “presidential branding” carry forward in commercial arenas to prompt consumers to choose products associated with the brand? Cork Wine Bar accuses Trump of stealing business away because patrons are attracted to Trump's presidential status. Many presidential candidates create logos for their campaign for immediate recognition and voter support. If we concede that, yes, presidents have and continue to brand themselves in the same way product manufacturers do, can the president assert trademark infringement if his or her presidential brand is misused or infringed upon for another’s gain? Imagine Trump’s iconic comb-over used by a company that sells a hair growth product. What if a corporation that manufactures and sells high-end soaps rekindled Obama’s Hope poster but replaced the word “hope” with “soap?” What if the Cork Wine Bar that is suing Trump changed their name to the Oval Office—with iconic décor to match—in hopes of stealing business back away from the Trump International Hotel? Would the president or his office have recourse against the Oval Office bar in the form of a trademark infringement or unfair competition suit? It seems that is the very thing the Cork Wine Bar is suing over now: Trump’s use of his presidential “brand” to unfairly compete in commerce. Is this a legitimate claim? Answering these questions is a great exercise in understanding precisely what a trademark is and whether or not an infringement has occurred. In order to infringe on a trademark, the mark must be used to promote a competing or related product or service. When looking at it this way, the hair and soap examples above become easier to dismiss. But what if our president in 2020 pitched what he or she called “The New New Deal,” proposing to reform government assistance and end Social Security benefits? Now we’re looking at a competing product and perhaps a basis for suit. Trademark competition philosophy. Isn’t this fun? Even more interesting, perhaps, is Trump’s defense to the Cork Wine Bar lawsuit. He filed a motion to dismiss the lawsuit, claiming presidential immunity, also known as sovereign immunity, a legal cloak designed to prohibit the president from facing personal liability for official acts committed as president. 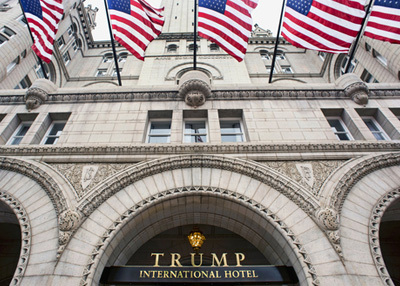 At first glance, you may think owning and operating a hotel is not an official act committed as president; however, in reality, Cork’s complaint is alleging patrons are seeking to go to Trump’s hotel because of the simple fact that he is president. Being president is arguably an official act of the president. So, let’s argue it. What do you think of Trump’s defense? Is it applicable here? We find trademark and unfair competition lawsuits, in all forms and fashions, fascinating. This is particularly true when the trademark itself, the infringement, or the alleged competition is hard to define. Experts can give definition and clarity to your claims and defenses. If you have a brand you’re about to go to battle over, let us find the best experts for you.